INGREDIENTS: 2 1/2 cups of brown rice, cooked per instructions Cooking spray 2 thick slices of red onion 1 baby red bell pepper, sliced 1 baby orange bell pepper, sliced Handful of mushrooms, quartered 1 zucchini, cut into spears Sea salt and freshly cracked pepper, to taste Garlic powder, to taste Soy sauce, to taste DIRECTIONS: Cook the rice per instructions; set aside. Heat a grill pan over medium high heat then coat it with cooking spray. Place the veggies into the grill pan and let them sit for 4-5 minutes before flipping. Cook for another 3-4 minutes then remove from the pan. Let the vegetables cool a bit before dicing them up. If you use leftover rice, heat the rice in the microwave. 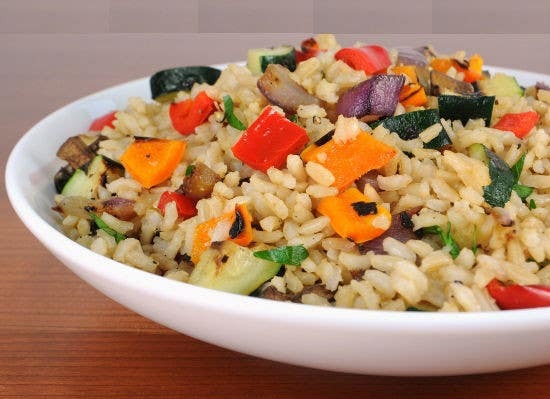 Place the rice into a large mixing bowl then add the grilled veggies, sea salt, freshly cracked pepper, and garlic powder, to taste. Toss well then taste; re-season if needed. Serve with a drizzle of soy sauce.